I highly suggest clicking on the image to view it larger. 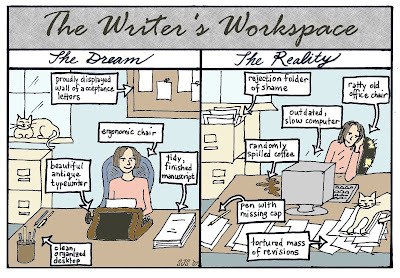 The only way in which my office resembles the dream workspace is that I have an antique rolltop desk--whose surface unfortunately resembles the workspace on the right, only much worse. To get my desk, you have to add in some writing-related books, haphazard in-trays, random art supplies, and a Teenage Mutant Ninja Turtle. What's on YOUR desk? 4. FOUR, count 'em, FOUR notepads with various story bits scribbled on them. One of them is a lovely blank book given me by my agent. It's so pretty it's still... blank. A stack of edits from the novel-in-process, a plastic bubble level, an empty film cannister, a pair of bamboo chopsticks, two address labels, a tiny figure of Roo (from Winnie the Pooh), the stereo remote, a small framed quote, my SCBWI name tag/membership card thingy, two CD's, the computer (mustn't forget that), FIVE ink pens, a PG&E rebate booklet, a box of paper clips, a stack of quarters, and quite a bit of dust. Okay - six ink pens.